An executive for the hit US sitcom "The Big Bang Theory" snuck an anti-Trump message into the show's credits in an attempt to sway voter turnout for the coming midterm elections. 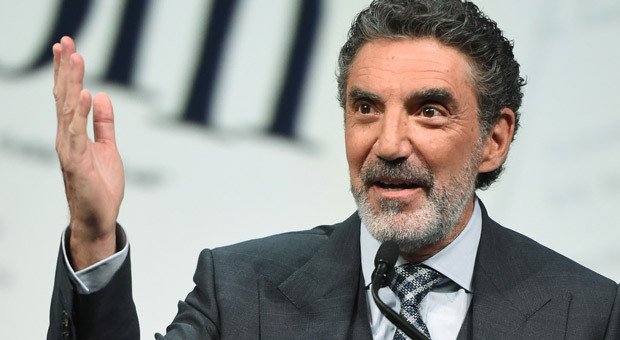 In a message entitled "My Prayer," Chuck Lorre pleaded with God to swing the midterms to combat “fascist, hate-filled, fear-mongering, demagogic, truth-shattering, autocratic golf cheater” President Donald Trump. The message also urged God to aid Robert Mueller in his investigation into alleged collusion between the Trump Campaign and Russia. 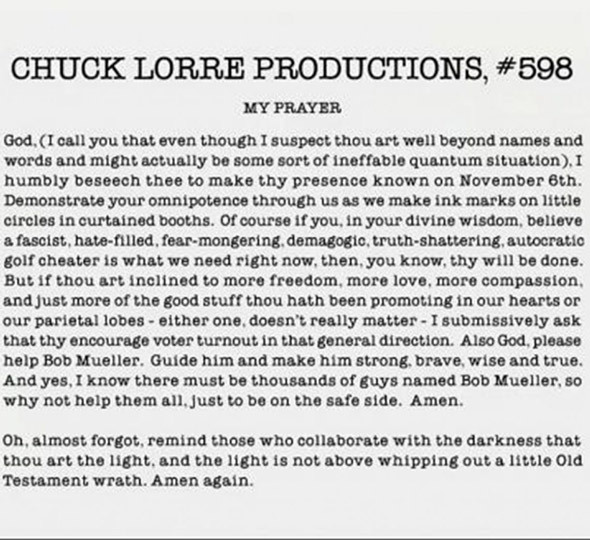 Lorre's "prayer," which was noticed and captured by Media Research center contributor Rebecca Downs, was inserted between the show's closing credits and the Warner Bros. logo on the October 25 episode. It avoids referring to Trump by his name but urges “God” to “make thy presence known on” Election Day. “Of course if you, in your divine wisdom, believe a fascist, hate-filled, fear-mongering, demagogic, truth-shattering, autocratic golf cheater is what we need right now, then, you know, thy will be done,” reads the message. “But if thou art inclined to more freedom, more love, more compassion, and just more of the good stuff thou hath been promoting in our hearts or our parietal lobes – either one, doesn’t really matter – I submissively ask that thy encourage voter turnout in that general direction,” the message continues. CBS did not immediately respond to a request for comment from Fox News. Chuck Lorre Productions places messages referred to as “vanity cards” after each episode and there have been 598 different cards to date. This is not the first time Lorre has included an anti-Trump message in his vanity cards. In a November 2016 card, Lorre mocked the "Make America Great Again” slogan as “a bumper sticker for victimhood." The exec has also mocked “The Apprentice” ratings, noting that it didn’t beat his show “Two and a Half Men” back in a 2017 card. The “vanity cards” have been used for everything from political messages to wishing Lorre a happy birthday.